The play between two dancers calls for trust. Yet what if one of them is a robot? 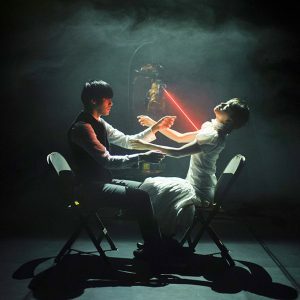 A DUET OF HUMAN AND ROBOT, is a contemporary dance from Taiwan, which provides the answer on stage. A man, who has grown emotionally barren, and a machine with human intelligence are locked in an inimitable duet. Together they create an astonishing demonstration of the future; or rather, of our day, where people and smart machines already coexist. The dance is not a mere reflection of the beauty in both mechanics and body movements. The dance is an interpretation of the hidden emotions of out time. A performance that calls for thought. As a child, he longed for a robot companion. As an adult, he created a robot in order to dance with it. 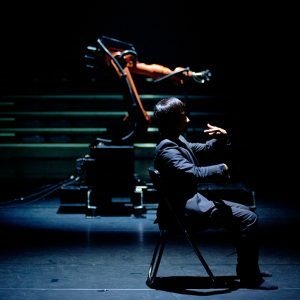 Acclaimed Taiwanese choreographer and dancer Huang Yi and his robot companion KUKA will bring uncompromising precision and skill to Plovdiv. Blending art and science, body movements and mechanical engineering, A DUET OF HUMAN AND ROBOT is a poetic work with a pertinent message. 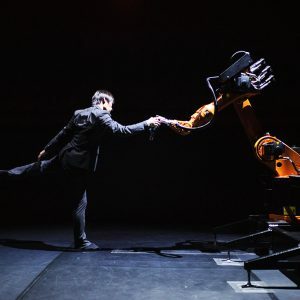 Human nature is revealed through dance, visual art, and robotics. Huang Yi and KUKA are joined on stage by dancers Hu Chien and Lin Jou-Wen. I was born in a wealthy family. When I was 10, my parents went bankrupt. My family of four moved from a splendid house to a 40-square foot room. As a child, who was constantly moving from one tiny room to another and seeing my parents go through suicide attempts, I grew up knowing that I had to be perfect. I grew detached from my emotions in order to be that perfect child, and be like a robot: obedient, friendly, outstanding, considerate, never rebellious, and without much personality. As a child my favorite cartoon was Doraemon: a Japanese animation character and a cat robot which is always there to solve problems for his owner. Ever since then I have been involved with robots. Is it because they are unconditionally loyal? Or is it because they are objective and altruistic? Thankfully, my parents didn’t mind me becoming a professional artist. Art became for me the best outlet for my suppressed emotions. That is why I wanted to find a way to dance with a robot. I found a way, and now, thanks to Quanta Arts Foundation in Taiwan, I have my robot. For me, A DUET OF HUMAN AND ROBOT is a process of giving beauty to the sorrow and sadness of my childhood. It is the expression of loneliness, doubt, self-awareness, and courage. I tried to create a beautiful illusion just to assure the others that everything was fine. I wanted to remind humanity of our simple conviction that we are all just grown up kids, but still kids. Developed in Germany as an industrial innovation, KUKA is a robot with mechanical hand applied in many factories. However, one machine takes on the role of a dancer. 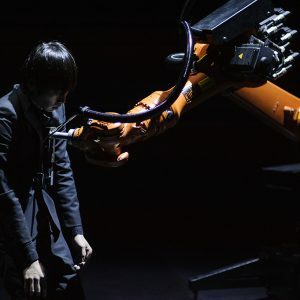 The robot is programmed particularly by Huang Yi for this production. It’s worth saying that 1-minute of its choreography takes about 10 hours in manual setting. KUKA weighs 274 kg, and with its platform and stabilizing weights, the total stage weight equals 795 kg. 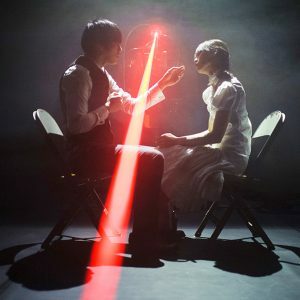 Attention: There are lasers and bright light used in the performance. The show will be presented in Plovdiv with the support of Ministry of Culture Republic of China (Taiwan). Two dancers play one and the same character, at different times of his life. In youth and in old age, they move in different ways, express themselves differently. They have become unlike each other, as the march of time inevitably changes the individual. If we could journey back in time, would we change anything? Avoid the mistakes? And what would happen then? The Czech audiovisual show GUIDE is an illumined panorama of life, where before and now merge, in order to summon the other “I”. Choreographer Vera Ondrašíkova will debut in Plovdiv for the 10th anniversary of ONE DANCE WEEK festival; with this award-winning dance spectacle. Vera Ondrašikova graduated from Academy of Performing Arts in Prague (Choreography) and Fine Arts. Her dancing career goes through common projects with Czech and international productions to reach the First Prize at Masdanza Festival in the Canary Islands, Spain in 2005. Her performances have been presented at Tanec Praha Festival, the Biennale de la danse in Lyon, Aerowaves Festival in London, Aerodance in Amsterdam, Cynetart in Dresden and Masdanza in Spain. After spending 3 years in Dresden (2010-2013), Vera returned to her homeland in 2013. She choreographed Vaclav Havel’s Anticodes at the New Scene of The National Theatre in Prague. The show toured New York, Miami and Washington. Vera has led workshops for many companies such Laterna Magica, Prague Chamber Ballet, Archa Theatre Lab and countless others in Germany, Spain, Mexico and UK (BeNext). As a visual artist and dynamic light installations master, Dan Gregor founded Macula 3D mapping studio. While in charge of the company’s video production, Dan participated in mapping creations on Prague Clocktower, New Museum of Liverpool, Nuit Blanche Festival in Brussels, Skyway Festival in Torun, Poland, and others. Dan was in charge of the visual effects in the Czech National Theatre’s play based on the experimental poetry by Vaclav Havel. In 2015, together with the Norwegian musician Biosphere, he founded the creative platform for audiovisual research INITI.org. With the support of: Tanec Praha / PONEC – dance venue, Ministry of Culture, The City of Prague, AV MEDIA, RPishop, Nethemba, DAMU. The show will be presented in Plovdiv with the support of Czech Center in Sofia, Embassy of the Czech Republic in Sofia, Ministry of Culture Czech Republic. Choreographer, artist, vocalist, songwriter, performer, provocateur… Now Ivo Dimchev offers a completely new format. 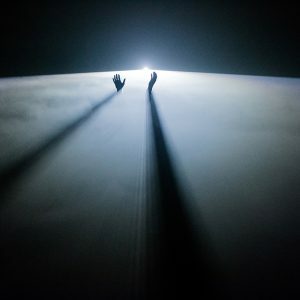 The musical group performance SCULPTURES is also the title of his newest album, and the songs are the backbone of this unique performance, standing on the border between a pop concert and contemporary dance performance. Im bored of singing behind a microphone, though I like it, I love the restriction of it… I like the oppression of it, but it’s time to revisit the Madonna format. She failed in it… I saw it… at Madison Square Garden… she overloaded it. We’ll do less, more quiet, more kind to the eyes… more loving. After the successful premiere of SCULPTURES at the Vienna National Theater in August this year, the performance will be presented for the first time in Bulgaria. 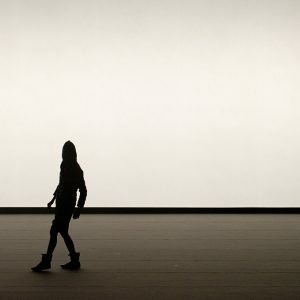 So far, Ivo Dimchev has participatedin the festival with PARIS (2012) and P PROJECT (2013), in which his unique performative and financial interaction with the audience awakened the spirits in the cultural and media space. In recent years, he has published 2 books: STAGE WORKS 2012-2016 and LYRICS AND PEDERATUSES. In Japanese MATOU literary means to put on, to clothe. Like the snakes and the cicadas which molt their skins, this word also sais that humans also renew their skins in evidence that they are alive. 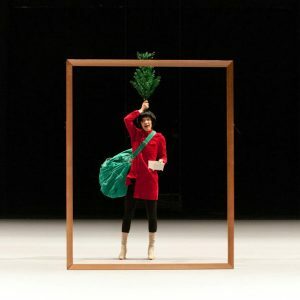 MATOU is a solo dance in which Japanese performer Ruri Mito exhibits her own unique system of movement and masterful choreography. Ruri Mito stepped into the art of dance at the age of 5, and found a home in the halls of the Tokyo Institute of Modern Ballet. 30 years later, she is a dancer and choreographer with a number of awards from competitions in Tokyo, Seoul, Yokohama, Jerusalem, and Gdansk. Her performances have been shown at the Royal Opera of Sweden, as well as in Spain, Germany, Great Britain and Hungary, among other countries. She has collaborated with great names in modern choreography, including Sasha Valtz, Akiko Kitamura and Inbal Pinto. She is now actively performing, competing and teaching in Japan and internationally. Yokohama Dance Collection EX, 2014. MATOU will be presented in Plovdiv with the support of Arts Council Tokyo. What do artists try to say? What do we understand? 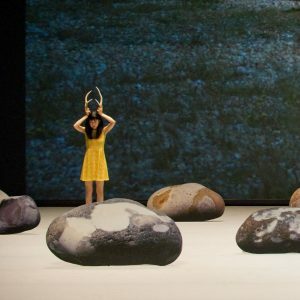 Korean choreographer Byung-jin Lee will TRY to get right to the point with this 20-minute long performance. He attempts to overcome the distance between artists and spectators. 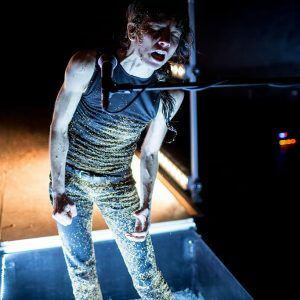 The choreographer explores everyday life to find deviations, absurdities, shallowness… And eventually to strike a chord: Do we ever understand ourselves rally? Love affairs may start in flames and burn like fire. Yet sooner or later, the relationship falls into routine. Feelings fade away. A gap of loneliness widens between partners. The unexpected alienation of your beloved one is a personal drama. And a common issue for millions of people around the world, too. Can we do something when it happens to us? Dance miniature BETWEEN by South Korean company MOMEURO MOVEMENT LAB gives an answer. The piece calls the will to win back your lover. 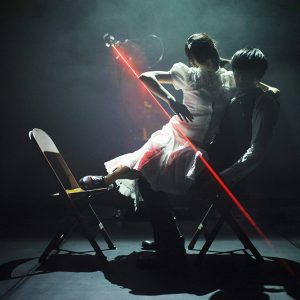 On stage, performers and choreographers Kyum Ahn and GaYoung Lee represent an ordinary couple in a casual setting, in order for their message to come out all the brighter. Fight for your love. MOMEURO MOVEMENT LAB research institute is a creative group based in Seul, South Korea. Their spectacles are based on the idea of heading to people. Founded in 2013, MOMEURO MOVEMENT LAB now is a rising star in Korea, performing also abroad in China, India and other counties. BETWEEN is created by MOMEURO MOVEMENT LAB and will be presented in Plovdiv with the support of Arts Council Korea. The SKIN | TRY | BETWEEN shows will be presented in Plovdiv with the support of the Seoul International Choreography Festival. Colors, they say, make life beautiful. But now that we have captured all nuances, tones and shades in high-resolution, are not we conversely captured by digital images? 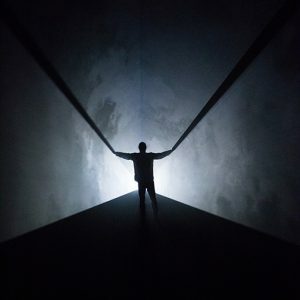 The Japanese performance Chroma is a play of light and shadow, visual effects and large graphics that chase and overwhelm the players on stage. Director Shiro Takatani employs the laws of physics and contemporary optics to challenge spectators to find meaning in the flood of images that inundate us daily, visual data through which we create the world we see around us. Takatani found inspiration in Simon Fisher Turner’s music and the book Chroma: A Book of Colour (1994), the last work of the English artist-filmmaker Derek Jarman. As in the book, a meditation on vision and its loss — Jarman suffered from AIDS-related blindness — the performance intersperses poetry, anecdotes and quotes from thinkers Aristotle, Leonardo, Newton, Goethe and Wittgenstein. We can only know the present within the dimension of time, and only grasp a small quantum of space. As we mature, we realize how insignificant our existence is, like a dot in ever-growing space. We try to orient ourselves within this linear labyrinth the only way we can, through events. By accepting the uncertainty, and drawing ourselves out of the relentless chaotic current of history, we may concentrate on the expression of the beautiful in the everyday. The theme of our experiment is: How are we to appreciate image and sound today? Ever since the shift from analog to digital technologies, we have been blessed with high-resolution sound and video, but have we found meaning in them? Have we forgotten everything we experienced before? Like Spinoza, who polished lenses in order to see the beauty of the world, we have technologies today that can capture the world moment by moment in minute detail, but do we employ them in any meaningful way? So far, it seems, we’ve only reached convincing façades, not the actual, often harrowing beauty of the real. Chroma is not based on a script; it is rather an experiment thatattempts to rediscover art as pure experience. — ShiroTakatani, January 2012. Shiro Takatani has been active in performing arts for many years. A graduate of Kyoto City University of Arts, he and fellow students founded Dumb Type in 1984. His breakthrough as an artist came with his first solo installation frost frames (1998), which drew acclaim from many cultural organizations around the world. Alongside his activities within Dumb Type, Takatani has created a number of installations and performances under his own name. 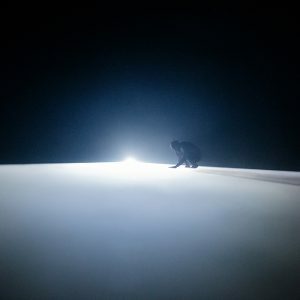 He was commissioned by the Natural History Museum of Latvia in Riga to create two video installations: Ice Core and Snow Crystal for the 2005 group exhibition Conversations with Snow and Ice, dedicated to Ukichiro Nakaya’s research on snow and ice and nominated for the 2007 Descartes Award for Excellence in the Explanation of Scientific phenomena. He also joined the three-week British arctic expedition “Cape Farewell: a cultural response to climate change” together with scientists, writers, journalists and artists from different countries. The related group exhibition was presented at the National Museum of Emerging Science and Innovation in Tokyo, in 2008. Takatani’s works have been shown in the United Kingdom, France and the United Arab Emirates, among other countries. His installations have also been selected for various museums’ permanent collections. In 1990, Takatani participated with critical theorist Akira Asada in the art project Stadsmarkeringen Groningen – Marking the City Boundaries, led by architect Daniel Libeskind to mark the 950th anniversary of the City of Groningen in the Netherlands. 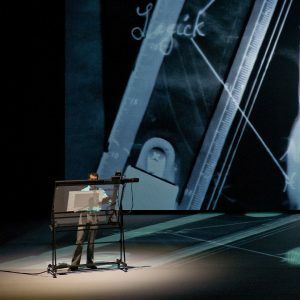 In 1998, he was commissioned by Art Zoyd and the Lille National Orchestra to create video images for a project combining symphonic music and new technologies. 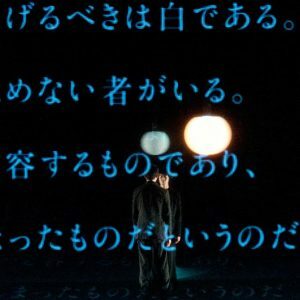 Takatani later met composer Ryuichi Sakamoto, with whom he has created several shows and installations, combining words, music, theater and dance. Takatani has also collaborated with the fog sculptor Fujiko Nakaya in the 2001 Valencia Biennale, where they created the harbor front installation IRIS, followed by two more large-scale installations with her: Cloud Forest (2010) at the Yamaguchi Center for Arts and Media [YCAM], and Asuka Art Project (2011) at the Asuka Historical National Park in Nara. Takatani’s works have been presented at the Martin-Gropius-Bau in Berlin, Israel Museum in Jerusalem, Romaeuropa Festival / MACRO in Roma, Royal Academy of Arts in London, Musée d’art contemporain de Lyon, GREC Festival in Barcelona, Festival de Otoño in Madrid, Museum of Contemporary Art Tokyo, Lille 2004: European Capital of Culture, The National Museum of Art Osaka, and elsewhere. In 2015, Takatani received the 65th Fine Arts Prize (Media Art) from the Japanese Government Culture Agency. Founded in Kyoto in 1984, Dumb Type is comprised of artists from diverse backgrounds— dance, theater, music, design, architecture, programming—all contributing to a great variety of stage and installation productions over the years. Regardless of genre, the essence of their work addresses socio-political apathy, and the today’s technological reality on a global scale. Dumb Type toured their early multimedia works Pleasure Life (1988), pH (1990-1995) and S/N (1994-1996) worldwide before the untimely death of the group’s artistic director Teiji Furuhashi, a prominent HIV/AIDS activist, in 1995. 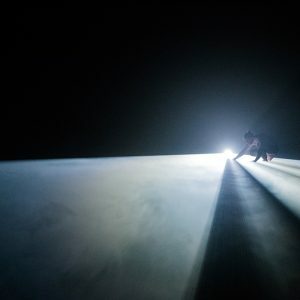 Since then, the ensemble has continued under the direction of Shiro Takatani, creating such later works as OR (1997-1999), memorandum (1999-2003) and Voyage (2002-2009), with composer Ryoji Ikeda joining in several productions. Production: dumb type office Ltd. The show will be presented in Plovdiv with the support of EU JAPAN FEST, in partnership with Plovdiv 2019, Embassy of Japan in Sofia, Friends of Japan in Bulgaria club, Agency for Cultural Affairs Government of Japan, for the year of 2017, and Japan Foundation. THE NARRATOR goes into the darkest layers of the intimate female world. There, where secrets, unspoken truths, fears, and disappointments are hidden. Cecil da Costa dances, sings and undergoes extreme physical strain to expose the most painful memories on the stage. Because there is no other way to free herself. The artist is inspired by Attik Rahimi’s novel “The Stone of Patience”. The book’s protagonist is an Afghan woman who dares to talk to her husband, who is in a coma, about violence, sexual assault and oppression. Award-winning Spitfire Company returns with a one-woman tour de force of artistic performance, drama and with a universal message. In the show, the walls, which we ourselves built, are torn down. This dance is about the deep memories that the body cannot completely forget. It is a mirror for us to look into. Founded in Prague, Spitfire Company is an artistic platform for physical, visual, and dance theater. It is currently one of the most progressive ensembles of author theater in the The Czech Republic. Behind their success stands the combination of originality, the introduction of different genres and new forms finding in the art of the theatre. 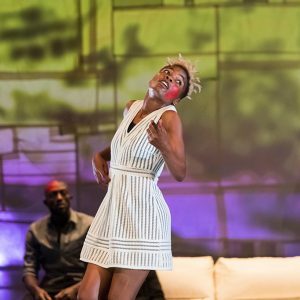 Spitfire’s productions accentuate on the physical presence on stage, the visual impact and the disproportions in the building up of the characters. Actor, singer, dancer, and choreographer, Cécile Da Costa graduated from the University Saint Denis, Paris XIII in Sciences of Education. The French/Portuguese artist currently lives and works in Prague as an integral part of Spitfire Company. She has been involved in much of the creative process – from choreography to actual performances on stage. Cécile Da Costa has also worked with Farm in the Cave international theater studio (Prague, Czech Republic), on the performances SCLAVI/ the Song of an Emigrant, Waiting Room, Divadlo/The Theater, and work demonstrations, under the direction of Viliam Dočolomanský and with the choreographic guidance of Charlotta Öfverholm (DV8). 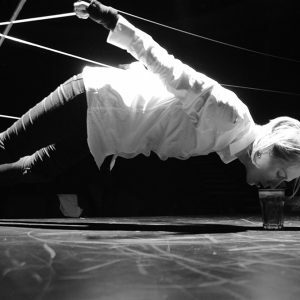 Cécile is running workshops of physical theater in France and the Czech Republic. Petr Bohac has an impressive record: co-founder and artistic director of Spitfire Company, guest director of Tantehorse company for new physical mime and dance, venue programmer of Palac Akropolis Theatre and founder of Zero Point Theater Festival in Prague. His performances have been successfully presented on three continents and awarded many prestigious awards such as Herald Angel Award. Petr Bohac was pronounced Person of the Year in the Czech Republic at “Alternative Theater” category. Herald Angel Award for One Step Before the Fall – Edinburgh Fringe Festival, 2013. Grand Prix Zdarzenia for The World of Condemned – International Festival Zdarzenia in Poland. The show will be presented in Plovdiv with the support of Czech Center in Sofia, Embassy of the Czech Republic in Sofia, Ministry of Cuture Czech Republic. The Spitfire Company was inspired by Muhammad Ali for their award-winning performance ONE STEP BEFORE THE FALL. In this contrasting solo dance, we see art punching heavyweight jabs to awaken the fighter in each one of us. The public is drawn into a dramatic interpretation of triumph and fall. Powerful dance by Markéta Vacovská and hypnotic sound by Lenka Dusilová give viewers a hint to their own identify. Ali’s story, from champion boxer to Parkinson’s sufferer, is in fact the story of everyone’s fighting fate. When the body and the mind are challenged to resist at any cost. As in life, the stage is turned into a boxing ring where unbending destiny meets our refusal to surrender. Until the very end. ONE STEP BEFORE THE FALL debuted in 2012 in Trutnov (Czech Republic). On the following year the spectacle won Herald Angel Award of the British newspaper “The Herald”, when it became the favorite of the public at the Fringe Festival in Edinburgh. 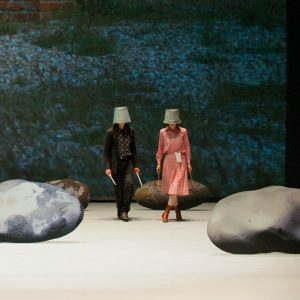 Markéta Vacovská and Petr Boháč, founder and artistic director of Spitfire Company, created the concept and the choreography of this unique theatrical experience. The multi-genre project deals with the themes of fighting, exhaustion, the symptoms of Parkinson’s Disease, and collapse. 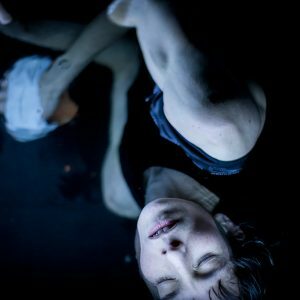 Founded in Prague, Spitfire Company is an artistic platform for physical, visual, and dance theater. It is currently one of the most progressive ensembles of author theater in the The Czech Republic. Their success is marked by creativity in connecting different genres and finding new visual stimuli. Spitfire’s productions include a number of distinguishing features: the emphasis of physical acting on the stage, experimenting with new theatrical features, existential imbalance of the figures and so on. While artistic director and co-founder of Spitfire Company, Petr Boháč is also working as guest director of Tantehorse company (new physical mime and dance) and venue programmer of Palac Akropolis Theatre. His performances have been presented in eleven European countries, the United States and Africa. Petr Boháč is also founder of The International Festival Zero Point, which brings the best of physical, mime, visual and multigenres theatre forms to Prague. His productions received several prestigious awards, including the Herald Angel Award and the Total Theatre Award (nomination) at Edinburgh Fringe. Boháč was also awarded the Outstanding Performance Award at Prague Fringe, the Next Wave Festival Award for the Personality of the Year, and the Award of Czech Theatre Times for the Personality of the Year at category Alternative Theatre. He is currently working on a new production called Vladimir Macbetin. Choreographer and dancer, Markéta Vacovská joined Spitfire Company in 2008. She has been involved in many of the ensemble’s productions since then. 2013 was a very successful year in her career – then she won the Czech Theatre Times Award for Personality of the Year (Dance and Choreography), The Herald Angel Award for ONE STEP BEFORE THE FALL, and was also voted Dancer of the Year by the Czech Dance Platform. In addition to performing, Vacovská is teaching classes at the Theatre Academy of Performing Arts in Prague. She has been working as certified Bikram yoga instructor since 2006. Regarded as a phenomenon of the Czech music scene, Lenka Dusilová is more than an acclaimed rock and pop star. She goes beyond different music styles into deep personal experiences. Her third solo album, Between Worlds, recorded in San Francisco with American musicians and produced by Ben Yonas, earned several Angel Awards in 2005. Her fourth solo album, Baromantika, yielded a unique musical landscape oscillating between seething and frigid acoustic electronic environments, and earning Lenka a fifth award as Singer of the Year 2011. It has been nominated for the new music Apollo Awards. Production: Studio Damúza o.s., Bezhlaví o.s. She is the beginning, transformation and brittle axis around which the family turns. She is mother. Belgian company Peeping Tom presents the most beautiful and the most difficult role in both life and on stage. One pictorial dance exhibition which shows the various conditions and stages in the life of the mother. From the body in a coffin, to a frightened little girl, to a 40-year-old woman locked in her own cage, the play goes beyond what we think we know about the mother. Beyond the obvious into her complex inner world, where fear, madness, and dreams rule. This is a meeting with her complex inner world where fear, madness, and dreams rule. Intended as a confession by choreographer Gabriela Carrizo for her mother’s death, the spectacle is actually influenced by all dancers involved. Their memories build up the show’s matrix and unlock disturbing thoughts about being a woman, a parent, a mother. 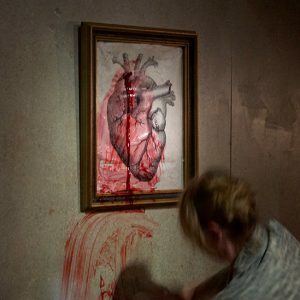 The audience is brought to a number of seemingly familiar spaces – maternity ward, funeral home, recording studio, museum. But nothing is what it seems. The body turns out to be a warehouse where consciousness and unconsciousness merge, collide, and determine who we are. Unexpected connections dart out of the blurred boundaries between mourning and celebration, order and chaos, to hold on and to let go. MOTHER (2016) is the second volume of Peeping Tom’s family trilogy that opened with FATHER (2014) and will close with CHILD. For 17 years, Peeping Tom’s hallmark has been a hyper-real aesthetic anchored to a concrete set: a garden, a living room, a basement, a residential container facing snowy hill … It seems familiar, but in fact, the stage is an unstable universe questioning logic, time and space. At the heart of the groups’ productions stands human nature, with its states, pain, and joy, with its dark side, which is worth enlightening. Peeping Tom’s Dance Theater starts with a transfer of experiences between artists, making it personal, dynamic and touching. 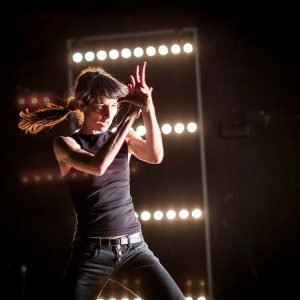 Born with the expressive language of motion and stage expression, artists use cinema techniques and sound effects recorded in real time while the shows are running. The Belgian company has won a number of international awards, including the Le Salon Best Dance Show in France (2005), the Mont Blanc Award for Young Directors at the Salzburg Festival (2007), the Patrons Circle Award at the International Festival Of the Arts in Melbourne and awards from other countries. Their show “32 rue Vandenbranden” won the prestigious British Olivier Award (2015) for the best dance performance and “Vader / Father” won the same category at an international competition in Barcelona. Gabriela Carizzo and Franck Chartier have been artistic directors of Peeping Tom since they co-founded the company in 2000. Born in Cordoba, Argentina, Gabriela Carrizo was ten years old when she began to dance at a multidisciplinary school. It had, what at the time was, the only group of contemporary dance for children and teenagers – the future Córdoba’s University Ballet. It was where Gabriela danced for a couple of years and created her first choreographies. She moved to Europe when she was nineteen, and over the years co-operated with Caroline Marcadé, Les Ballets C de la B and Needcompany. 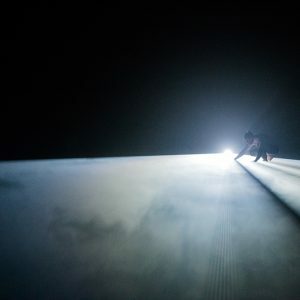 Her first solo piece, E tutto sará d’ombra e di caline, and Bartime, was followed by various collaborations, including the opera Wolf (2002), by Les Ballets C de la B. Gabriela Carrizo directed also The missing door (2013) for the Nederlands Dans Theater – NDT 1 in The Hague and The Land (2015) for the Ensemble of Residenztheater (Munich, DE). He began to dance when he was eleven. At the age of fifteen, his mother sent him to study classical ballet at Rosella Hightower in Cannes. Upon graduating, Franck Chartier joined Maurice Béjart’s notorious Ballet du 20ème Siècle. Three years later the show “Le spectre de la rose” came for Opéra de Paris. In 1994, Chartier’s artistic inspiration brought him back to Brussels where he settled down. He participated in productions of various contemporary dance companies, including Les Ballets C de la B, Nederlands Dans Theater, Needcompany and more. He created the choreography for the adaptation of Henri Rabaud’s opera “Marouf, savetier du Caire” by Jérôme Deschamps and Opéra-Comique in Paris (2013). In October 2016 Franck Chartier was awarded the prestigious Dutch price: ‘Swan Most Impressive Dance Production 2016’ for The lost room. Co-production: Theater im Pfalzbau (Ludwigshafen), Taipei Performing Arts Center (Taipei), KVS – Koninklijke Vlaamse Schouwburg (Brussel), GREC – Festival de Barcelona / Mercat de les Flors (Barcelona), HELLERAU – European Center for the Arts Dresden, Les Théâtres de la Ville de Luxembourg, Maison de la Culture de Bourges, La Rose des Vents (Villeneuve-d’Ascq), Festival Aperto / Fondazione I Teatri (Reggio Emilia), La Bâtie Festival de Genève. Moeder is supported by: Theater im Pfalzbau Ludwigshafen (DE) and Taipei Performing Arts Center (Taiwan), key partners in the Vader, Moeder, Kind trilogy. Peeping Tom wishes to thank: Alexandre Obolensky, Jean-Philippe Altenloh, Romy Beni, Heidi Ehrhart, Ina Peeters, Elias Vervecken, François Heuse, Theater FroeFroe. Politics, and the impossibility to get away from them, are dissected and revealed through the art of dance? The KALAKUTA REPUBLIK explores the stations and roles of the contemporary artists on the chess board, while revolutions explode and protest movements wane. The focal point is one brilliant person born in Africa in the last century – Fela Kuti. The father of Afrobeat, amazing musician and composer, bohemian and polygamist, Kuti made history as rebel prototype in Nigeria in particular and Africa as a whole. On and off the scene, he sharply criticized the regime, the army, corruption, colonialism – which have been festering issues since the 1970s. Kuti proclaimed his estate on the outskirts of Lagos for an independent state. That was the notorious Kalakuta Republic. It was later raised by the military in a siege. 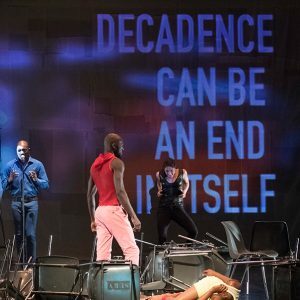 With this vivid and lively performance from Africa, choreographer Serge Aimé Coulibaly offers us one single point for contemplation: what we will do when it’s our turn to demand changes from the government? Politics is not a fly on the wall in choreographer’s Serge Aimé Coulibaly piece. Born in Burkina Faso, based in Belgium, he has created a political drama refracted through the human body in dance. Seven dancers file in a line on stage with movements that are metaphors of the urgency to live. Their unique body language is an amalgamation of traditional culture, dance club and jazz culture. The final result is an entirely new style of dance which dashes onward to describe current political and social issues. They take us to the Shrine, a mythical place, both temple and nightclub, where Fela Kuti sang about hope and revolution. 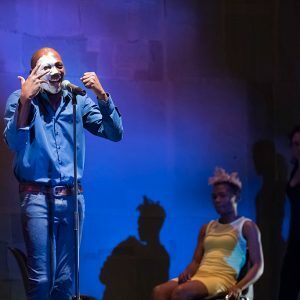 If the spirit of Fela, who remains a source of inspiration to many in Nigeria and abroad, is the central thread running through the performance; then Coulibaly keeps for himself the role of the narrator. Does he identify with Fela Kuti? Or is he simply himself, a committed artist entangled in the troubles of the world, and those of Burkina Faso, where youths long for freedom and change? As Slavoj Zizek has been warning anti-government movements for many years: it is not particularly difficult to whip up a crowd and to shout that things have to change. The important thing is what happens on the day after the uprising. 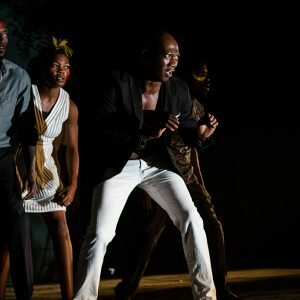 KALAKUTA REPUBLIK is neither a biography of Fela Kuti nor a musical showcasing of his work. Instead, the performance is a little piece of Africa without clichés. Today’s Africa. A continent on the global map that Serge Aimé Coulibaly and his companions are committed to and want to reveal to the rest. Moreover, KALAKUTA REPUBLIK is an inquiry about the commitment of an artist to their world, their society, the world in general. The obligation to take a position and express themsleves, even when the message is not popular. This idea is the foundation of the entire oeuvre of Serge Aimé Coulibaly. At the beginning of Coulibaly’s work, Kuti was mainly a source of inspiration, as his music entered the shows. His legacy inspires the entire production. Serge Aimé Coulibaly and his artistic team were inspired by this figure to research what artistic commitment might mean once the artist becomes the leader of a movement. KALAKUTA REPUBLIK does not offer answers but puts questions on the table. What brings people together to seek out alternatives? Why people need charismatic leaders? How much power do these leaders really have? Are there conditions? How much freedom is possible within a movement? KALAKUTA REPUBLIK has two parts. 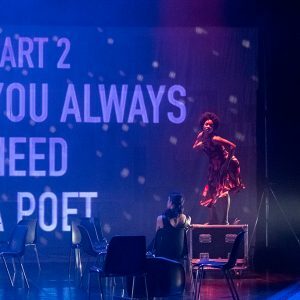 Part one is literally in black and white, using the perpetual movement of Fela’s music as the basis of an exploration of this contemporary “leader”. The second part uses bright colors and diversity of sounds to depict decadence as it takes power over the organization, and individuals fall into delusion. Which part precedes, and which follows? You choose. After the creation of “Nuit blanche à Ouagadougou”, the première of which preceded the departure of ousted president Blaise Compaoré in Burkina Faso by a few days, Serge Aimé Coulibaly continues to explore his theme of the absolute need to change our contemporary world. Nuit blanche à Ouagadougou speaks clearly about an African society but Kalakuta Republik puts the entire globalized world on the table. The spokesman for an entire generation, he turned the stage into a political platform, and music – into a weapon. Arrested over 200 times for his sharp satire against the regime and its corruption, Fela was a true reincarnation of devotion to the homeland and art. He opposed ignorance, oppression and awakened Nigerians in inimitable fashion. Kuti’s compositions, some up to 30 minutes in length, endowed with intricate complexity, have reached jazz clubs all the way to “distant” London. Thus, a new musical phenomenon was born. Fella Kuti named the independent Kalakuta Republic after his first prison. The Republic was indeed his mansion on the outskirts of Lagos. His band recorded music there until 1977 when military units stormed the mansion and destroyed the studio. After moving to the United Kingdom and the United States, the rebel could see his beloved Africa in the reality of world politics. Today Kuti is remembered for his remarkable musical innovation, turbulent personal life, inexhaustible desire for freedom, and pan-African beliefs. Fela’s legacy offered the choreographer and dancers a multitude of paths to explore. Its strength, combining beauty and commitment, allows for very expressive developments, ranging from violence, extremities, and emergencies, to harmony and fragility. Musician and composer Yvan Talbot played with it, twisted and even distorted it to create a whole new musical universe for Serge Aimé Coulibaly’s production. Born in Bobo-Dioulasso, Burkina Faso, and growing up in Belgium, Serge Aimé Coulibaly has been working as a choreographer and dancer for more than 15 years. African culture is his creative generator, and also the reason behind his engagement with social causes, powerful emotions and hope. Because of the ability to give a universal message and expressiveness to modern dance, Kulibali is well accepted on several continents. In 2002, he founded Faso Danse Théâtre and has so far looked at complex themes linked to the desire to provoke positive dynamics in younger generations. He is also the founder of the ANKATA International Performing Arts Area in Bobo-Dioulasso. At the same time, Culiballi collaborates with artists from France, Australia, India and other countries. He is an also a lecturer in leading academies of arts in Brussels and Rome. His openness to the differences in the world, his curiosity and willingness to share his accumulated experiences, shed light on his gift to create masterpieces of modern dance, sometimes even involving amateurs. Co-production: Maison de la Danse Lyon (FR), TorinoDanza (IT), Le Manège –Scène nationale de Maubeuge (FR), Le Tarmac – La scène international francophone Paris (FR), Les Théâtres de la ville de Luxembourg (LU), Ankata Bobo Dioulasso (BF), Les Récréâtrales Ouagadougou (BF), Festival AfriCologne (DE), CC De Grote Post Oostende (BE). With the support of: Musée des Confluences Lyon for the residencies, and Fédération Wallonie-Bruxelles, dance department.